Growing shrubs in the landscape offers many benefits, among them privacy. A fast-growing shrub can create a screen or hedge that blocks unwanted views, muffles sounds and defines areas within the landscape. Hedges can be formal or informal. A formal hedge requires regular pruning and shaping. The University of Rhode Island recommends pruning fast-growing, informal hedges -- or a row of shrubs allowed to grow naturally -- in early June, in mid- to late-July, and again in early to mid-September. Choose fast-growing shrub species to create a screen. 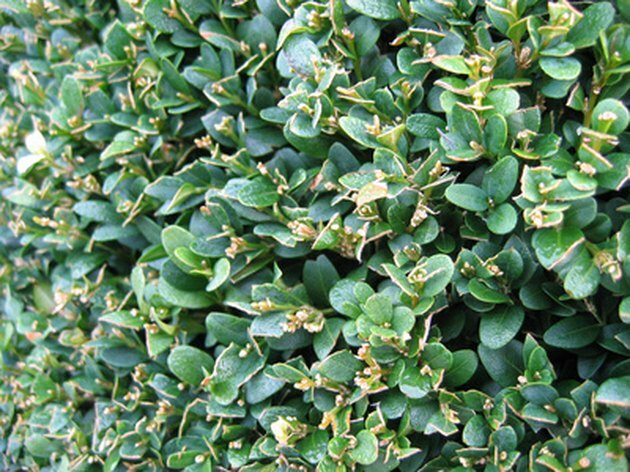 Medium evergreen shrubs, or shrubs up to 6 feet tall, offer screening foliage all year. Fast-growing species include abelia (Abelia grandiflora), bamboo (Bambusa spp. ), banana (Musa spp. ), banana shrub (Michelia skinnerian), cape jasmine gardenia (Gardenia jasminoides), Chinese rice paper plant (Tetrapanax papyriferus), euonymus (Euonymus japonicus), Indian azalea (Azalea indica), Pfitzer's juniper (Juniperus chinensis pfitzeriana), primrose jasmine (Jasminum primulinum) and viburnum (Viburnum suspensum). Tall evergreen shrubs, or shrubs more than 10 feet tall, produce privacy screening year-round. Fast-growing, tall species include arborvitae (Thuja x 'Green Giant'), Arizona cypress (Cupressus arizonica), blue vase juniper (Juniperus chinensis 'Blue Vase'), Burford Chinese holly (Ilex cornuta 'Burfordii'), cherry laurel (Prunus caroliniana), chindo viburnum (Viburnum awabuki 'Chindo'), Chinese eleagnus (Eleagnus Pungens), Emily Bruner holly (Ilex x 'Emily Bruner'), firethorn (Pyracantha unnamemisis), Japanese cryptomeria (Cryptomeria japonica), Koehne holly (Ilex x koehneana), Leyland cypress (X Cupressocyparis leylandii), ligustrum (Ligustrum japonicum), Nellie Stevens holly (Ilex x 'Nellie R. Stevens'), oleander (Nerium oleander), pineapple guava (Feijoa sellowiana), pittosporum (Pittosporum tobira), redleaf photinia (Photinia glabra), redtip photinia (Photinia x fraseri), sasanqua (Camellia sasanqua ) and wax myrtle (Myrica cerifera ). Deciduous shrubs provide fall color and summer shade but lose their foliage during colder months. Fast-growing species up to 10 feet tall include althea (Hibiscus syriacus), American hazel (Corylus Americana), bridal wreath spirea (Spirea prunifolia plena), common elderberry (Sambucus Canadensis), common ninebark (Physocarpus opulifolius), hardhack (Spiraea tomentosa), Japanese quince (Chaenomeles lagenaria), lantana (Lantana spp. ), mock orange (Philadelphus coronarius), narrow-leaved meadowsweet (Spiraea alba), Reeve's spirea (Spirea Reevesiana), shadbush (Amelanchier laevis) and smooth hydrangea (Hydrangea arborescens). Fast-growing, deciduous shrubs that grow more than 10 feet tall include American bladdernut (Staphylea trifolia), American plum (Prunus Americana), gray dogwood (Cornus racemosa), hazel alder (Alnus serrulata), pale dogwood (Cornus oblique),prickly ash (Zanthoxylum americanum), red osier dogwood (Cornus stolonifera), rough-leafed dogwood (Cornus drummondii), staghorn sumac (Rhus typhina) and winged sumac (Rhus copallina).